Today’s recipe is a simple way to enjoy shrimp at its full flavor and juiciness: salt-roasted shrimp (Saeu-sogeum-gui: 새우소금구이). There are a lot of ways to prepare shrimp, you can fry them, steam them, put them in a pancake, or add them to soups or stews. 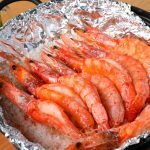 But this way is very simple and quick and looks really pretty when you present it on the table: in the pan with the juicy red shrimp resting on a bed of salt. 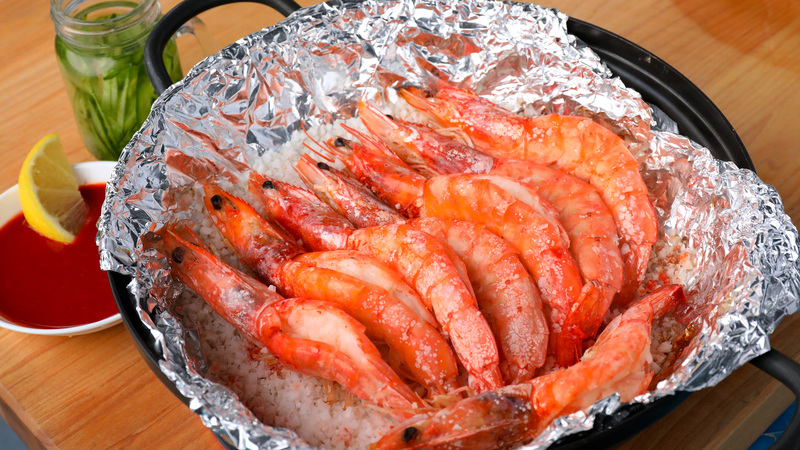 Roasting shrimp on salt has a number of benefits. It draws out water from the shrimp and shells so they cook perfectly and quickly, without drying out. They remain sweet and plump, and perfectly salted. The salt you use needs to be chunky sea salt so that it has little contact with the shell, and any salt on the shell can be easily removed. As you see in my videos and website I usually use kosher salt for my cooking but it won’t work in this recipe. Even Kosher salt is too fine. I tried it and the shrimp was totally covered in salt, even when I picked it off the shrimp was too salty for me. I got this salt in a Korean grocery store, imported from Korea, but you can probably use any coarse and chunky sea salt. I use jumbo shrimp in this recipe, but you can use smaller shrimp if you want. They will cook faster so be sure to adjust your cooking time so they don’t dry out. This is a popular dish in Korea and in Korean restaurants or as a side dish served with alcohol (anju) at a Korean bar. I like to split the shrimp and clean them before I roast them, that way they don’t curl up when they cook. They lay flat and look more appetizing. Also, I heat up the salt first so it’s good and hot when I roast the shrimp, which means less cooking time and less time for the shrimp to curl or dry out. When I lived in Korea I used to go with my friends to the west coast and have this dish. They served huge jumbo shrimp on a bed of salt, still alive! Cleanup is easy, because you can just take the tin foil out of the pan and it’s clean. Save the salt! It’s infused with a mild shrimpy flavor and is great for cooking, like when sauté vegetables or when you want a bit of shrimpy flavor in your a soup or stew. Just put it in a container and use it later. Mix all the ingredients in a small bowl. Set aside. Using scissors, cut down the back of the shell and make a shallow (¼ inch) slit down the back of the shrimp, exposing the dark vein that runs along the center of the back. Open it up, pull out the vein, and wash under cold running water. Drain and pat dry with paper towel. Put a double layer of tin foil in the bottom of a thick and shallow pan. Mine is 8½ inches across and 3 inches deep. Add 1 to 1½ cup salt and cover. Heat over medium high heat for 4 to 5 minutes until you hear the salt ticking and popping and it turns a little brownish on the bottom. Open and add the cleaned shrimp, side by side. 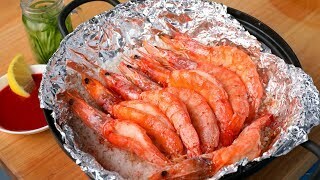 Cover, reduce the heat to medium, and cook for 5 minutes, or until the bottom of the shrimp looks about 70% cooked. Open and turn them over. Cover and cook 2 more minutes. Serve right away in the pan with the dipping sauce. Posted on Friday, November 16th, 2018 at 12:18 pm. Posted November 17th, 2018 at 11:32 pm | Log in to reply. Ha! Ha! Maangchi, you are so great! Next time we will see you preparing food in a hurricane! I can tell you are adventurous. This dish looks very good! This recipe was originally posted on November 16, 2018 at 12:18 pm by Maangchi. The video was watched 263,409 times on YouTube & has 11,169 likes!